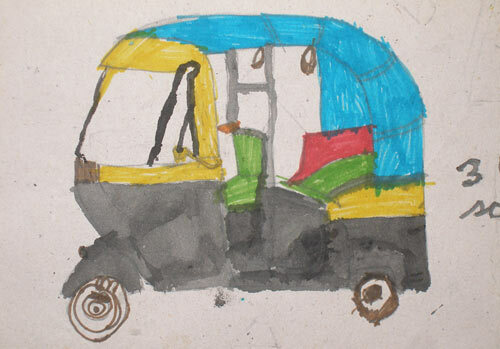 For some reason, Dad thought it was a good idea to preserve this scribble of an auto rickshaw, which (he says) I drew when I was about eight. Going through some really old folders during a cleaning mission, he digitized all my childhood drawings, and now I have all of them. Yay! As a kid, I once asked my parents why grown-up artists drew funny-looking, purple people and scratched paint onto their canvases. Dad, a painter, made an unsuccessful attempt at explaining abstraction. Mom, an art historian, talked about different art movements, schools and styles. I was intrigued, though most of it missed my brain by miles. After the age of ten or so, children start to mimic the way adults draw. They try to make things look realistic, have grown-up themes, and they over-think. Then the charm evaporates. It’s true for any art. Filters of knowledge and technique do bring in some amount of inhibition and restraint in any creative effort, don’t they? Nice.. always wanted to be an artist. But my dreams were crushed when I found out that I could only draw an apple in the shape of a square. I love your distorted auto vai! 🙂 I love how well you have detailed out everything and your sense of proportion is quite wonderful. It is a wonderful sketch for an 8 yr old! But i kinda disagree at some points. I think a child’s painting, especially forms, are full of abstractions. They draw what they see but they leave out all the details that makes a drawing complex leaving only the pure form of the subject and hence its essence become clear, reduction becomes a pattern. There’s a unmistakable similarity between the way we graphically express signage and a kid’s drawing since both have a quality of simplicity in them. By lacking abstraction, I meant intentional abstraction. Children’s forms look abstract by default, I think. As a child, I do not remember consciously drawing only the essence of what I saw and observed, or simplifying it deliberately. That’s such a wonderful observation.